The 1963 World Series Most Valuable Player Award went to Los Angeles Dodgers pitcher, Sandy Koufax, who drove an Avanti. After Koufax tamed his blazing fastball, he enjoyed a five-year stretch as perhaps the most dominating pitcher in the game's history. He won 25 games three times, captured five straight ERA titles, and set a new standard with 382 strikeouts in 1965. His fastball and devastating curve enabled him to pitch no-hitters in four consecutive seasons, culminating with a perfect game in 1965. Primary Position: Pitcher Bats: R Throws: L Primary Uniform #: 32. Played For: Brooklyn and Los Angeles Dodgers (1955-1966). 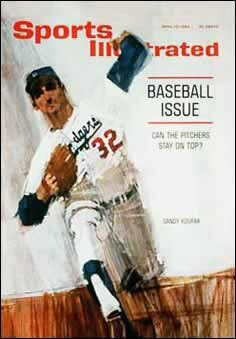 Koufax on the cover of Sports Illustrated. 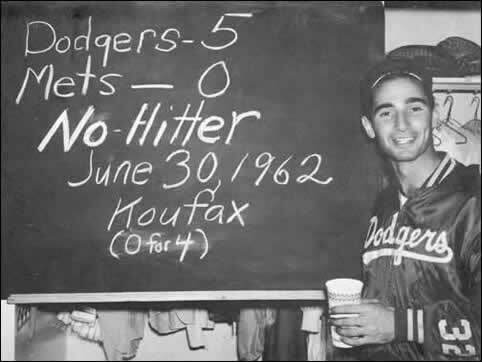 Sandy Koufax at the "No Hitter" chalkboard in June 1962. 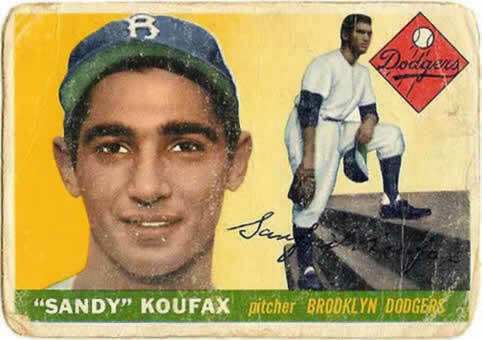 Sandy Koufax Brooklyn Dodgers baseball card.